Discover a varied offer of budget adventure tours that will take you through some of the most renowned destinations such as Moshi and Barafu Hut. Each affordable tour will provide you with memorable experiences for some of the lowest prices on the market. "Loved it. Superb. Mzui a ball of energy. Great start to climbing. Now ready for Kilimanjaro..."
"Nice trip with more adventurous"
"I did the 10-day Rwanda, Kenya and Tanzania tour with Expedition Africa ! and I'm..."
"Great people and great service Expedition Africa provided great services for us during..."
"Kilimanjaro and Safari in Tanzania Leken Adventure organized our trekking tour this..."
"Best trip of a life time in Tanzania." 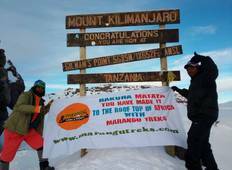 "We did the famous Kilimanjaro Trek with Kilimanjaro Wonders Expedition Safaris and..."
"I dont have words! It was life-chaging! Everything from start to finish was excellent!" 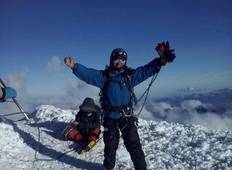 "Zara Tours is the Best Kilimanjaro outfitter in the region. Our trip was extremely..."
"Отличное сафари в Микуми Брали сафари тур из..."